The Kruger National Park is our flagship park, and with good reason. The first and most important thing you should know about it is that it is big. Very big. 2,000,000 ha. And in all this space, there are a few tarred roads, some more unpaved ones, 12 rest camps, four satellite camps, 5 bush camps, 2 bush lodges and 4 exclusive game lodges. This gives you an enormous choice of accommodation but, more important, leaves a vast percentage of the park undeveloped.Of course, it's not really about accommodation, is it? 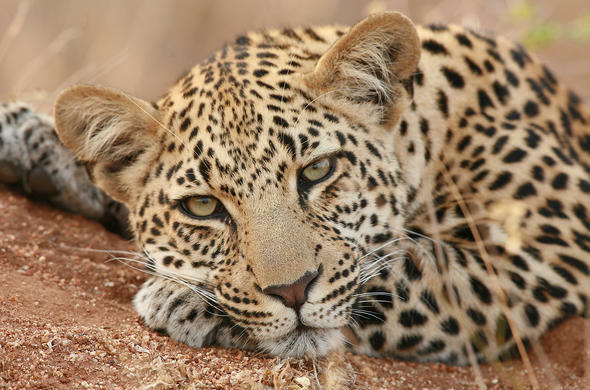 Kruger is home to an impressive number of species: 336 trees, 49 fish, 34 amphibians, 114 reptiles, 507 birds and 147 mammals, of which you, will see only a fraction.The rest camps are pretty civilised with electricity and all mod cons, while the main camp, Skukuza, is practically a small town. Within the camps, accommodation ranges from comfortable cottages to camping. The bush camps are much smaller and far more rough and ready, while the bush lodges are pretty remote and offer real privacy and a sense of being deep in the bush. The exclusive game lodges are run by private companies in the park on concession and offer all the expected luxuries.Now after this seemingly long list of facilities, just think back on how big this place is - 2,000,000 ha. You can get quite far off into the bush if you want to. Most people, however, do stay within an hour or two of the main camps. It's all a matter of choice. But Kruger is as wild as you will get anywhere.The Great Limpopo Transfrontier Park is still in its infancy but when it does start operating, guests will be able to move between Mozambique, Zimbabwe and South Africa. Even more important, so will the animals.As well as driving around the park in a rental vehicle, you could choose to do an escorted game drive with a ranger, a night drive or an escorted walk of a few hours. More adventurous options include wilderness safaris, where you could walk out for four days/three nights deep into the wilderness - with a ranger, of course - and an escorted wilderness multi-day four-wheel drive trail. The larger camps have swimming pools and other facilities, and there is a nine-hole golf course at Skukuza. Berg-en-dal, Bateleur and Mopani have conference centres.Kruger is reached by flying directly into Skukuza, or into Kruger Mpumalanga International Airport in the south or Hoedspruit or Phalaborwa in the north. It is a drive of about six hours to the southern part of the park from Johannesburg and about eight hours to the northern part via Polokwane (ex Pietersburg).